Visible Ink Press, 9781578594207, 477pp. From atomic bombs to zealous zombies, this cinefile's guidebook reviews 1,000 of the wickedest, weirdest, and wackiest scary movies from every age of horror. 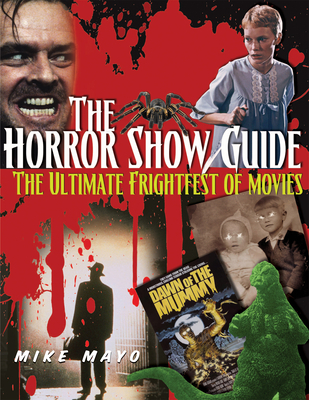 With reviews on many overlooked, underappreciated gems such as Alice Sweet Alice, Daughters of Darkness, and Zombie, as well as the numerous Stephen King adaptations and modern updates such as Night of the Living Dead 3D and The Wolfman, new devotees as well as the discriminating darkcinema enthusiast will love this big, beautiful, endall, beall guide to an always popular film genre. Established directors, including Wes Craven, John Carpenter, Tim Burton, David Cronenberg, and Guillermo del Toro are given their due, as are the new generation, represented by Larry Fessenden, James Wan, Alexandre Aja, and others. In addition to the hundreds of horror film reviews, this guide includes fascinating and fun top10 lists and sidebars that are designed to lead fans to similar titles they might not have known about. Mike Mayois a former host of the nationally syndicated radio programs "Max and Mike on the Movies" and "Movie Show on Radio." He has written for the "Roanoke Times" and the "Washington Post" and is the author of "VideoHound's DVD Guide,"" ""VideoHound's Video Premieres," and "VideoHounds War Movies." He is a member of the Broadcast Film Critics Association and the Mystery Writers of America. He lives in Chatham, New Jersey.